Do you have an adorable two- or three-year-old who is simultaneously the love of your life and the bane of your existence? Yeah, got one of those, too. Keep reading to find out how we survived the terrible twos and threes. Now, my son is like me, super chill and compliant by nature, so we hardly experienced the terrible twos with him. My daughter, on the other hand, is like her father, a strong-willed force of nature who has to do everything herself. Her “terrible twos” started when she was 18 months old and lasted until now when she’s about to turn 4. That first year was intolerable because we could not figure out what made her tick! She didn’t seem to respond to any kind of correction or training. We tried positive reinforcement, but she didn’t care about our approval or rewards. She cared more about getting that lollipop into her mouth now! We tried time-outs, and this girl would calmly stand in the corner and proceed to deliberately pee in her underwear as a form of protest. I would remove her toys and privileges, but she didn’t care. She’s not very materialistic like that and would rather see it all burn rather than give in. Redirection kinda worked, but it mostly served to defuse tantrums and I’m not sure it made any lasting impressions. 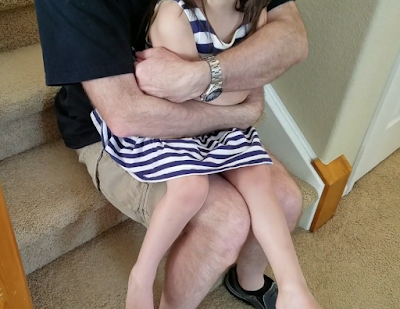 After much trial and error, we developed what I call the “straitjacket hug.” See, our daughter really values her independence, so what we do is take away her physical freedom. I put her on my lap facing away from me, put her hands in each of mine, and then wrap my arms around her. If she starts kicking me, I clamp her legs between mine. And she basically stays like that until she apologizes (and I believe it’s genuine). If she does it again, then she gets a tighter hug and for a longer period of time. The pros of this method is that it’s a good way of helping her to calm down because sometimes she has trouble calming down on her own. And in public, it looks like I’m merely hugging her, not disciplining or hurting her. (No Child Protective Services, thank you very much...) My daughter even asks me to hug her backwards when she needs comforting, so clearly she knows the difference between a corrective hug and a regular hug. The cons is that she's free to cry and vent her frustration vocally, so usually I stay silent till she’s calmed down and apologized before attempting to talk about her behavior. Now that we’re out of the terrible twos and threes, we don’t have to use the straight-jacket hug as often. She knows that as soon as I lock her down, I’m going to patiently out-wait her no matter what it takes. And now that she’s almost four, every day doesn't feel like a battlefield from sunrise to sundown, and I feel like I can actually breathe a little. I’m so grateful we found a simple disciplinary method that’s effective and works well for our family. So to all you parents of young kids who are at your wits end, don’t give up. Keep researching, keep trying new things, and eventually the tide will turn and this season will pass. what tips and tricks do you have for surviving the terrible twos and threes? Comment below to share your experiences because I’d love to hear them. I know you’re doing an amazing job parenting your kid, so chin up and I’ll see you next time! Subscribe to my YouTube Channel for practical life hacks on marriage, parenting, and pet care – so you can care for all the members of your family!